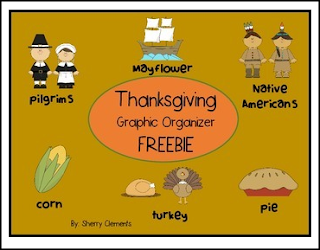 This is the graphic organizer I plan to use with my students for their planning after we read and research about the first Thanksgiving. We will list words to make a Thanksgiving web including any words we think about when discussing the first Thanksgiving. I included a few graphics to help them remember the words they were writing. They can add more graphics if they choose to as they write words. See how many words/phrases they can write. They will use their graphic organizers to write their "First Thanksgiving" book this week. I hope you enjoy this FREEBIE. Please take just one moment to leave me some feedback. I really appreciate your comments! Come back and get my other freebies. I hope you can use some or ALL of them in your classroom.